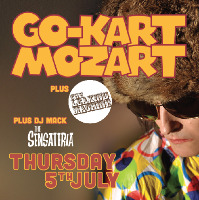 Go - Kart Mozart, fronted by ex Felt and Denim frontman Lawrence, with support from The Leaking Machine (ex Mighty Mighty) and DJ Mack - Sensateria. First Birmingham appearance by Go - Kart Mozart, fronted by musical genius and ex Felt and Denim frontman Lawrence. On their new album 'Mozart's Mini Mart, Lawrence adopts the persona of 'the sardonic Lucifer', a devilish character who pin pricks his way through a myriad of absurd scenarios while dragging a bin bag of pomposity and injustice to the council tip of songdom !!! All this is done with the usual Mozart tongue in cheek witticisms, it's as if Orton met Coward on the way to the kitchen sink. Support from The Leaking Machine (ex Mighty Mighty) and DJ Mack - Sensateria.